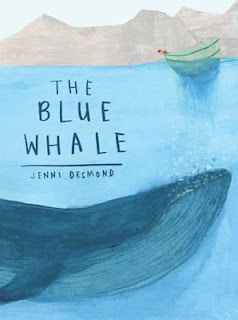 The great blue whale. Did you know it was hunted near extinction in the 1960s? In 1966, it became a protected species thanks to a global ban on hunting. But blue whale numbers are still low, thanks to many different issues from habitat destruction and pollution, to entanglement. This beautiful book follows a little boy who grabs a book from the shelf and starts to read all about this magnificent creature. He learns the whale is the largest living animal on the planet. It's heart is as big as a small car. Blue whales are actually grey but look blue under the water, and every whale has unique markings, just like our fingerprints. This is a fascinating book with rigorously-researched detail and a clear love, by the creator, of this gentle giant. Whimsical, textured illustrations vary from full scenes to bright, light vignettes, creating a visual joy. And all the while, the little boy we meet at the beginning, comes along on the journey, interacting with the whale and bringing a gentle visual narrative to the text. Sensational for learning. Priceless for sheer enjoyment.